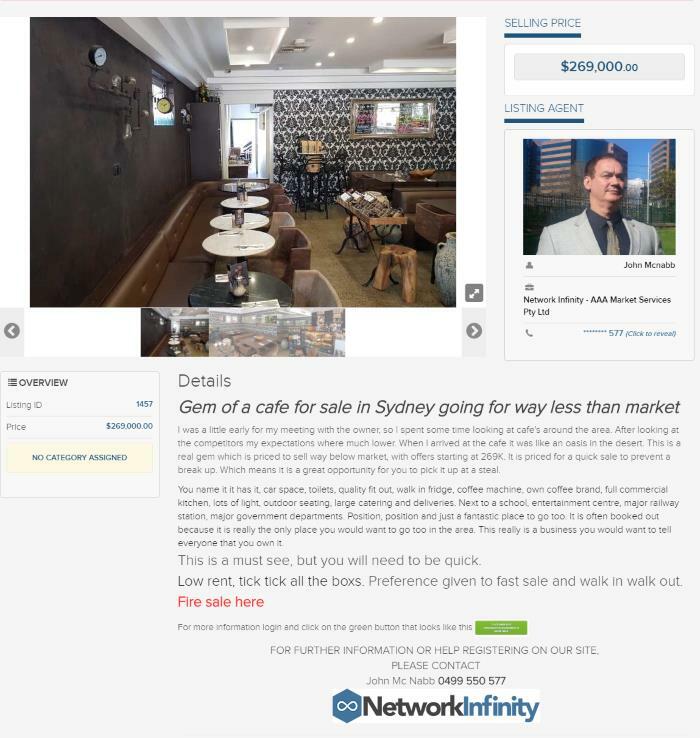 Why not contact us if you are planning to sell your business in Sydney or New South Wales, we are the experts. Here is an example of a listed business near you. I was a little early for my meeting with the owner, so I spent some time looking at cafe's around the area. After looking at the competitors my expectations where much lower. When I arrived at the cafe it was like an oasis in the desert. This is a real gem which is priced to sell way below market, with offers starting at 269K. It is priced for a quick sale to prevent a break up. Which means it is a great opportunity for you to pick it up at a steal. You name it it has it, car space, toilets, quality fit out, walk in fridge, coffee machine, own coffee brand, full commercial kitchen, lots of light, outdoor seating, large catering and deliveries. Next to a school, entertainment centre, major railway station, major government departments. Position, position and just a fantastic place to go too. It is often booked out because it is really the only place you would want to go too in the area. This really is a business you would want to tell everyone that you own it. This is a must see, but you will need to be quick. Low rent, tick tick all the boxes. Preference given to fast sale and walk in walk out.